On Saturday morning we were in the coffee shop at the hotel and met Michael Voron. He said to make sure we stopped down to their table and get a free doll...then he said action figure :) We stopped down and were able to meet his wife Ali. 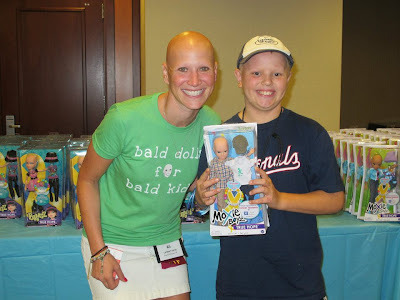 Ali is a motivational speaker and voice over actress and has had alopecia areata since 1995 she considers herself lucky to be able to help others and did in a big way this weekend. When she saw the Bratz "True Hope" collection hit the shelves a few weeks ago knew she had to do something. 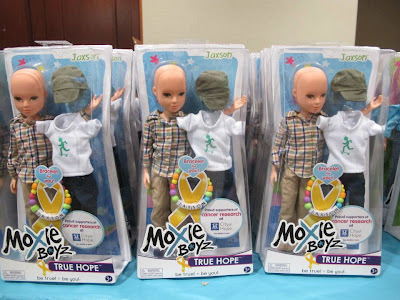 The dolls (or action figures) :) are both boy and girls and have no hair or eyebrows...perfect for kids with alopecia areata. 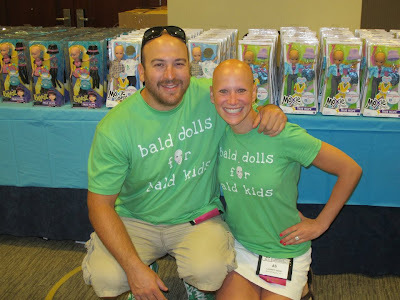 Ali started the Ali Bratz Project with a goal to raise $8,000 to buy enough dolls to bring to the NAAF conference and give out to the kids. In just two weeks they were able to raise over $12,000! There were lots of bald girls and boys that were getting a free doll (or action figure). 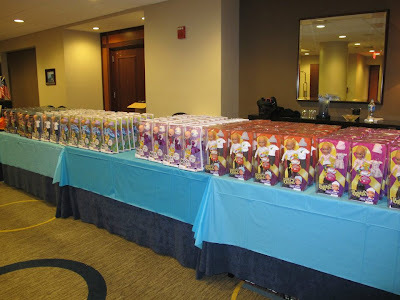 A total of over 400 dolls were given out on Saturday morning. It was so cool to see the smiles on not just the kids faces, but also the parents. You can check out Ali at alilambert.com and follow the Ali Bratz Project on facebook at www.facebook.com/AliBratzProject. Thank you so much for this awesome post! We loved meeting Blake yesterday and it's obvious that he is very cool guy with so much confidence! HE is an inspiration to us and we are so glad we had the opportunity to meet him and your entire family! Go Phillies! Thanks Mike and Ali. My brothers and mom were sorry they couldn't get to meet you too. My brothers had to stay home sick and miss the conference. 'Life, Liberty and the Pursuit of a Cure"
Hey now you're an All Star!